I don’t understand what the Netflix film Bird Box is, and truth be told, I’m not super interested. If people want to watch Sandra Bullock stagger around blindfolded, I’m not going to judge. Because there is something fascinating about people working within dramatic limitations. When someone is using a bow-and-arrow with their feet, or playing guitar with their teeth, or bopping around our a forest while rocking an eye-kerchief, people tend to pay attention. I know I do. I think that’s also part of the appeal of the power trio. It’s three musicians trying to sound larger than just guitar, bass, and drums. Jimi Hendrix did it to great success, also occasionally taking tooth to guitar, and he made it look easy. But even with all of his genius, it’s not hard to imagine Hendrix, had he not been taken from us so young, moving beyond the power trio. Similarly, Stevie Ray Vaughan launched his recording career fronting a power trio before eventually adding keyboards. It’s because the power trio can be liberating, providing ample sonic space for every instrument to have its say, but can also be limiting, like working in miniature to create a world that seems full-sized. 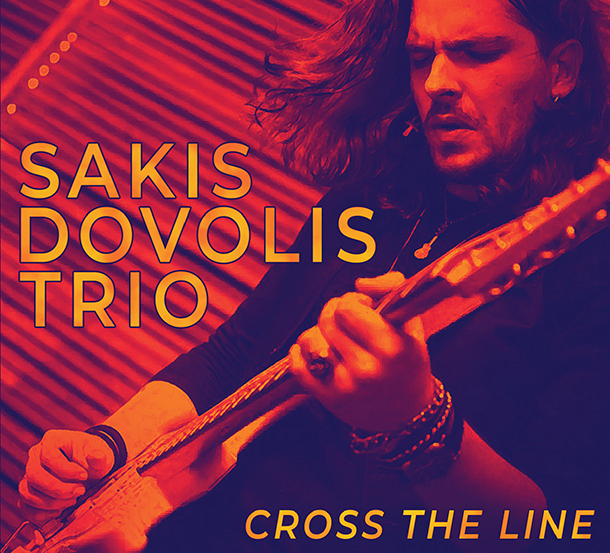 Which is why the Sakis Dovolis Trio’s debut, Cross the Line, is a brave entry into the power trio world. Dovolis is a Greek singer/guitarist who’s very much influenced by Hendrix, injecting his songs with an uptempo funk and lots of fluid, technical guitar playing. Interestingly, due to the fast-paced songs, much of the album has a sleaze-rock, glam energy. Some of the tracks are reminiscent of Nashville’s Screamin’ Cheetah Wheelies, who expertly deployed that particular sound. Dovolis has a strong rock voice and fantastic guitar chops, both lead and rhythm. And working in a power trio, he effortlessly combines both jobs. The challenge of this album is that the tones and funk rhythms are all very similar, which give the album a consistent, recognizable sound, but also make the songs begin to bleed into each other. “All Over You,” the funky lead track, has a Hendrix-derived wah-drenched energy, but “Come On,” which follows immediately, does, too. Even his cover of ZZ Top’s “Nasty Dogs and Funky Kings” has its tempo pushed to where the song doesn’t breathe like the original. Dovolis and his band are capable of playing with great energy, but when that energy is the same across songs, individual tracks don’t pop. Ultimately, this is more a challenge of the power trio more than the fault of Dovolis. He and his band simply have less sonic textures at their disposal. Dovolis has guitar skills to spare and a surprisingly strong singing voice. Hopefully the band will learn to air songs out and to explore more dynamics. There’s nothing bad or distasteful about this album. Every song is well-produced and well-executed. Dovolis just might need a broader sonic palette to draw upon. Some keyboards and additional guitar tones, as well as more varying tempos, would make for a fantastic follow-up album. Dovolis draws a lot from Hendrix but ZZ Top are also no slouches when it comes to effective power trios. Dovolis might look a little harder at them for his next album. I have and love this album. I love this type of sound and enjoy the songs quite a bit. I think it’s a great first album!